Figure 1: Determination of optical skin parameters and fluorescence with a reflecting measuring head. Optical spectral analysis plays an increasingly important role in the field of biomedical research. 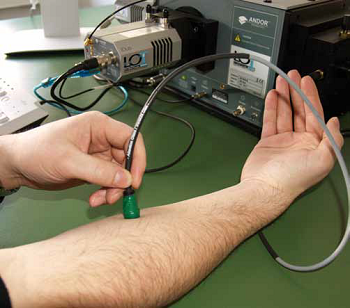 In this application the use of an Andor Shamrock 303i spectrometer in combination with the optical detectors iDus DV420A-OE (UV-VIS) and iDus InGaAs DU490A-1.7 (IR) for the development of new medical diagnostic tools is described. The main focus points to the development of innovative non-invasive optical detection methods for the diagnosis of illnesses as a substitute for existing wet-chemical procedures and the development of quick, cheap screening systems for the early diagnosis of widespread diseases. A further application is the optimization of skin carcinoma therapy. Nowadays hematocrit (Hct) is used as an important blood parameter for various illnesses like iron deficiency, loss of blood, or fitness state of a person in both medicine and sports medicine. With the present analysis methods approximately 100 μl blood must be taken from a human vein. For a topical application instead of this invasive method an optical measurement method for determining the Hct is under development. In order to obtain the necessary calculation parameters the transmitted radiation (wavelengths in the range 600 nm to 1700 nm) and reflecting spectra of skin surface (spectral region: 400 nm to 1000 nm) are detected at the fingertip. 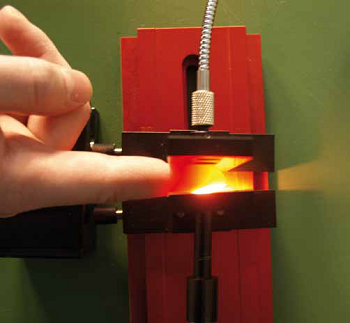 A halogen lamp is used as a light source and a spectral analysis of transmitted and reflected light is processed by means of the spectrometer and the Andor Solis software. On the basis of the detected spectra the hematocrit, the concentration of hemoglobin, and the water content will be calculated accurately. Figure 2: Determination of optical skin parameters and fluorescence with a reflecting measuring head. In Germany nowadays about six million people are suffering from Diabetes Mellitus Type 2. It is estimated that there are eleven million people still in a pre-stage of diabetes. Normally the diagnosis of diabetes is carried out after the first appearance of the symptoms. Long time before the blood glucose concentration raises the number of Advanced Glycation Endproducts (AGEs) in the skin. These AGEs are accepted as an early biomarker of diabetes. The concentration of AGEs also increases with age. If the concentration lies significantly above average a person would be diagnosed as ill.
AGEs show fluorescence with an excitation wavelength 360 nm and emission wavelength 430 nm. The fluorescence and reflecting qualities of the skin surface are measured with an optical reflection head. The light sources are a high-power UV-LED (wavelength 365 nm) and a high-power neutrally white LED. The approximate concentration of AGEs can be determined by the analysis of the skin fluorescence spectra. 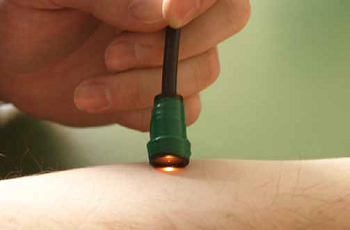 The ascertained data are used for the development of a quick, favorable diagnostic screening system. Figure 3: Determination of the blood compound by a transmission measurement at the fingertip. The biological efficiency of optical therapy systems in photodynamic therapy is described by the combination of the optical qualities of the applied photosensitizer and the light system. With the Andor spectrometer system the absorption characteristics of photosensitizer precursors from different manufacturers and the end product Protoporphyrin IX are determined as well as emission qualities of different therapeutic agents. The best biological efficiency is achieved if the optical properties of the light sources are well adapted to the optical absorption qualities of the photosensitizer. The modular construction of the Andor Shamrock 303i spectrometer system provides a toolbox of different spectroscopic measurement modalities, which can be used in medical technology for the development of new diagnostic and therapeutic systems and applications. The system admits different measurement settings for spectroscopy in the wide UV-VIS-NIR region within one spectrometer system. For more information on current applications of the iDus DV420A-OE detector, iDus DU490A-1.7 and the Shamrock 303i spectrograph in our lab, please, contact us.